After federal officials arrested nearly half its work force in a raid last month, Agriprocessors has scrambled to fill positions at its Postville plant. 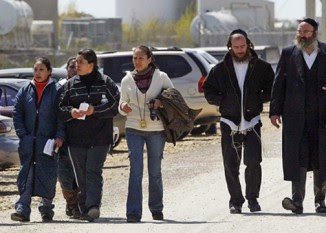 NEW YORK (JTA) -- In an effort to restore lagging production at its Iowa plant, the country's largest kosher meat producer has been hiring workers from homeless shelters in Texas to replace employees detained in a massive federal immigration raid last month. According to a spokesman for the meat producer Agriprocessors, workers are recruited by a firm in Amarillo, Texas, and sent to Postville. In Iowa, they are processed by Jacobson Staffing, a Des Moines-based company that screens them for drugs and alcohol, and ensures they are legally permitted to work in the United States. Several Postville officials say the new arrivals have created problems for the town. Police Chief Michael Halse told JTA that his officers had arrested four plant workers for disorderly conduct last week. The Rev. Paul Ouderkirk, the leader of the local Catholic church, which has played a key role in helping former workers and their families after last month's raid, said a mentally challenged woman from Texas had come to his church seeking help with prescription medications. Diana Morris, in an interview Friday with Postville's local radio station, said she spent three days on a bus from Amarillo only to discover that she was expected to live with 10 men in a four-bedroom house that had no electricity or hot water. "Amarillo's homeless problem has become Postville's homeless problem," Jeff Abbas, who runs the KPVL radio station, told JTA. In a statement Friday to JTA, the newly hired compliance officer for Agriprocessors said any allegations that contractors had misled new recruits would be investigated. "We would note that we do not believe that homeless people should be prohibited from applying for employment from Agriprocessors," Jim Martin said. "In fact, for the appropriate individuals, we welcome the opportunity to offer them the chance to better their lives." Agriprocessors has been struggling to restore production since authorities conducted the largest immigration raid in U.S. history May 12 at the Postville plant. Nearly half the work force was rounded up. Some 300 workers are now facing deportation, having pleaded guilty to various forms of identity theft and fraud. The company's difficulty in restoring its normal production levels has sparked concerns of a kosher meat shortage around the country. Within weeks of the raid, a Waterloo staffing company withdrew an estimated 150 replacement workers from the plant, citing safety concerns. A group of Native Americans brought in from a smaller Agriprocessors plant in Gordon, Neb., left within days, saying working conditions were worse than expected and the company hadn't made good on its promises. Those reports have helped prompt several Jewish organizations to call for a boycott of the company. But Rabbi Seth Mandel, the rabbinic coordinator for the Orthodox Union, one of two agencies certifying the plant as kosher, says Agriprocessors merely is responding to the dictates of the market. "Most consumers will not pay a premium for free-range, natural or organic beef, no matter how much lip service they pay to the idea," Mandel wrote in an e-mail obtained by JTA. "The same thing holds true regarding employees and their working conditions. Meat packers would [have] no problem with paying higher wages and make working conditions better -- IF the consumers would pay the premium price thereby entailed." In her interview with the radio station's Abbas, Morris described how she was recruited from Amarillo with about 15 others and given a Greyhound bus ticket and $15 to pay for food during the 1,000-mile journey. She said she was promised 30 days of free housing as well as a $100 bonus upon arrival. What made the offer so attractive, Morris said, was the $10 per hour that Agriprocessors is now offering. "Everything down there is about $6 an hour being paid, and that's the minimum wage," she said of Texas. Juda Engelmayer, an Agriprocessors spokesman, said that Jacobson determined who was fit to work in the plant and that resources were provided to transport workers back to their homes if they weren't offered jobs. "They are given the opportunity and the means to go back where they came from," Engelmayer said. "I don't know if everyone takes it. Free citizens are free to move around as they wish."